We look forward to welcoming you to Mercure Portsea! 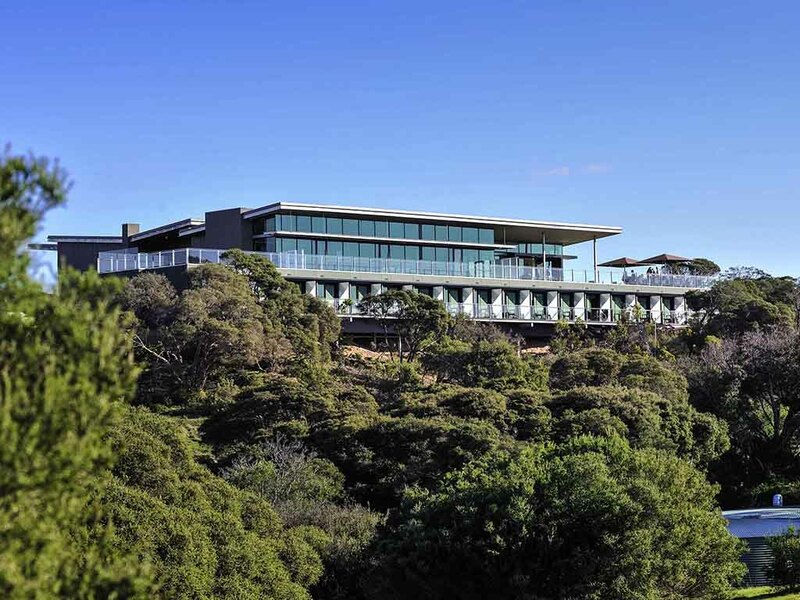 Located less than two hours drive from Melbourne, the Mercure Portsea has panoramic views of Port Phillip Bay. The hotel is a fully integrated development incorporating a golf club, accommodation and function complex. The 24 room resort is able to cater for upmarket tourists as well as corporate events, meetings and weddings. The hotel is located within walking distance to Portsea's calm bay beach and the lively Portsea Pubs. The rugged coastline including the famous London Bridge and Portsea Back Beach, which is ideal for surfing are also just minutes away. Mercure Portsea is a fully integrated development incorporating a golf club, accommodation and function complex. It is catered for upmarket tourists, corporate events, meetings and weddings. Mercure Portsea offers contemporary rooms, which come with balconies and views overlooking the golf course. Overlooking the picturesque 18-hole championship golf course and resort surroundings, the bar offers an extensive wine list which includes vintages from several local wineries. Very enjoyable, clean, neat, fun, great views and terrific golf course. The staff were all fantastic, very welcoming and proficient at all levels. The room was extremely clean and well equipped, beds were comfortable and the view was amazing. Upon our stay at your accommodation , we were given a room directly under the wedding reception room. It would have been nice to be notified that there would be a wedding at the venue or if guests that were not part of the reception be placed in an area far away from the noise and drunken people returning to their rooms. The Mercure Portsea the best place to stay. Lovely rooms and great breakfasts and staff. The service was great, it was quiet and Peter on the front desk was very helpful and very professional. Very comfortable, everyone was helpful and courteous. One night stay for me and my wife, booked the accom through Groupon so we can stay the night close to Peninsula Hot Springs. We would like to send our compliment to Tania from food services who was kind and patient with my food order due to my dietary requirements. She was friendly and helpful and the customer service on her behalf was exceptional. Unfortunate that the restaurant was not open in the evenings forcing guests to eat out. Closest restaurants in Sorrento, not much nearby. It was quite disappointing to find out that the restaurant, contrary to le accor website advertisement, is not covered for silver membership. Also, the first night's room was quite average, it felt like a prison room. Second night's room was adequate. Pleasant but cleanliness could be addressed. Initially everything looked nice and clean. From the shower you can see under the rim of the toilet, which you can't see from directly above, and it was disgusting. Obviously hadn't been cleaned in a long time. There was also mould in the grout of the shower. When I went to bed I found that my pillow case was dirty. The screen door was off its tracks. The walk down to where outdoor weddings are held is very steep and not meant for heels, you definitely need a better path than rocks and dirt. I would also like to make a mention of the lady working in the restaurant in the morning when we had breakfast (on the 30/3/19). Unfortunately I did not get her name but she was outstanding. She was very friendly yet utterly professional at the same time. She made sure we were well taken care of and nothing was too much trouble. All of the staff were great but this lady in particular was wonderful.